Before Christmas I visited my local Game department store to buy a computer and a USB external hard drive. Because the computer was not properly labelled, and for other reasons, I only bought the hard drive. I returned on Monday to see if the price tags had been fixed, only to find that someone had been fiddling with the machine. What they did was not nice, and clearly the store attendants have no idea how to fix it. It isn't nice to go to the System Restore utility and restore the system back to a previous point. That effectively wipes out a whole load of carefully installed programs! Not good. In the old DOS days hackers used to type "format c:". At one computer show we renamed format.exe and copied siren.exe to the drive and called if format.exe instead. That caught a few perpetrators by surprise! Another trick was to press Ctrl-Break on any machines running automatic demos, because the demo programs were usually written in BASIC and it stopped the demo dead in its tracks. 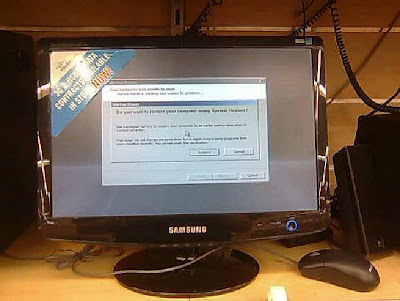 Today, demo machines should have the security locked down tight, or at least have screen savers with passwords on them, known only to the store staff. Alternatively, use Acronis TrueImage to restore the drive to a suitable image. But of course the technical expertise of a mass market department store is severely lacking. I guess PCs just aren't consumer items yet, and stores like Game can only compete on the basis of price.